@Novena | Get Your Grub On! It’s been a very lao time. It felt like a hundred years that I had been to ‘Lao Beijing’ but tonight I wanted to refresh my memory big time and went berserk on their menu. I spotted ‘Xiao Long Bao‘ (小笼汤包) so it came naturally to start with those favourite little steamers. Not being the prettiest of its’ kind, they were quite nice, had thin skin and a generous slurp of soup in ’em but neither the meat nor the broth had a too distinguished flavour. Dumpling time wasn’t over just yet so we had a round of awesome ‘Pork & Cabbage Jiao Zi‘ (boiled). The cool thing here was the cabbage, not very common and tasted great together with the fine meat mass. Aside another regular on my orders, some crunchy and slightly spicy, delicious garlic cucumbers. Over to the noodles some ‘Beijing Style Zhang Jian Mian‘ (老北京炸酱面) came our way. The noodles were soft and and thin and the whole thing tasted nice refreshing with all those chopped scallions but wasn’t really like a bean sauce but more like a lightish bolognese, nonetheless good. 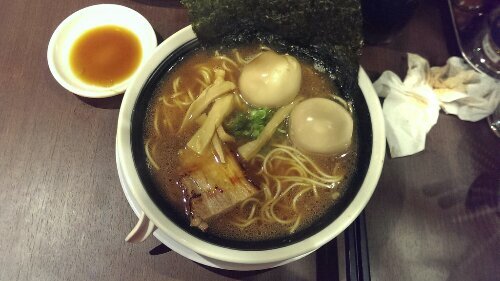 Also the ‘Dan Dan Mian‘ was more an interpretation of the bowl I like so much. Nearly a clear broth with some minced meat and chives taking a swim in it. No sesame, no peanuts, no gooey creaminess made this not really extra special but still tasty enough to give it a like. Even though the food was not sweeping me off my feet, it was still tasteful and delicious maybe with a slight setback caused by their modifications on my old time favourites. It’s quite a busy and bustling place at peak hours in a bit of a warmer setting than the usual dim sum restaurants and surely has some decent dishes to offer. I might come back to try their high tea buffet as even though I’m not a big fan of such, ‘Xiao Long Bao‘ free flow doesn’t sound too bad to me. Raw fish from around the corner. The night before our holidays we wanted to have some quick Japanese without too much traveling involved so we went ‘Rakuichi’ at the Oasia Hotel in Novena. 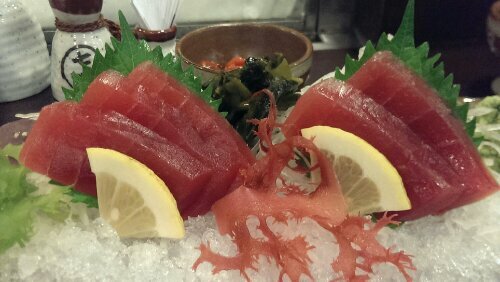 The ‘Akami Tuna‘ looked flawless and had a beautiful clean taste, unfortunately was also a lil streaky at bits. The ‘Ebi Sushi‘ also was close to perfect, fresh and with an outstanding snappy texture. Snappy is also the right word for the ‘Assorted Pickles‘ we had which were a brilliant combination of radish, gherkins, cucumber etc. with only one weirdly tasting purple something that I didn’t find too appealing. We also had their ‘Agedashi Tofu‘ which was kind of boring compared to others that I had and a big slice of ‘Wagyu‘ that had a nice nutty flavour but was nearly too buttery to eat too much of and sadly quite chewy as well. Last but not least we had one of their special spicy makis with prawn that I forgot the name of. The taste wasn’t bad but completely different to any other maki I had before as it was rolled in chilli flakes and topped with a lot of thinly sliced and flame touched sharpish onions. Not bad, not bad at all. I like how the place is setup, clean, stylish and minimalistic, they put a lot of effort into their presentation, the service was good and the food was too but for the higher price tag I was just expecting a little more “wow” for our dinner so ‘Rakuichi’ will probably not become my first go to address for my regular Japanese fix. My friend from Jakarta who stayed with me wanted to eat some porridge and I wasn’t feeling too well so we decided to go for something quick and dirty round the corner and ended up at one of my least favorite places, the Kopitiam in Velocity. At least it looked more appealing since they had renovated the whole food court last year. 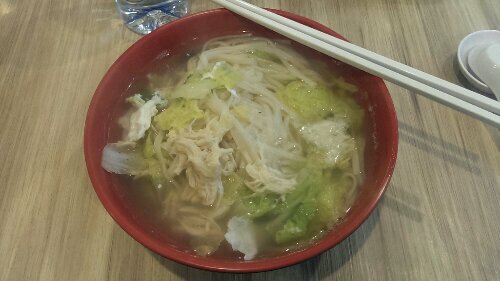 Looking for something that would be soothing my stomach I spotted a promising ‘Chicken Noodle Soup‘ at the ‘Korean Cuisine’ stall. There was nothing really special about this but it fitted the purpose. The soup was close to tasteless but therefore the natural flavors of the ingredients came out. There was a generous portion of rightly cooked rice noodles, leaves of cabbage, quite nice meat of chicken breast and a very funny squarish shaped hard poached egg. These were all very basic flavors without too much spices being used but it gave me back some of the power that I needed. I’m not a big fan of Kopitiam and probably never will be but this was quite okay and I might return for a light and cheap after-workout-meal sometime. It’s been now a couple of weeks since my beloved ‘Wee Nam Kee’ has moved from the recently torn down Novena Ville down to United Square about a kilometer south. I had a good workout today and needed some proper protein and carbs to fill up so I headed into exact this direction. Obviously I ordered their ‘Chicken Rice‘ from roasted chicken and simply replaced the oily yet delicious signature rice with the steamed version not to chuck all my morning efforts out the window. First up came their chicken soup which had a strong taste and was a great kick start that made me even hungrier. 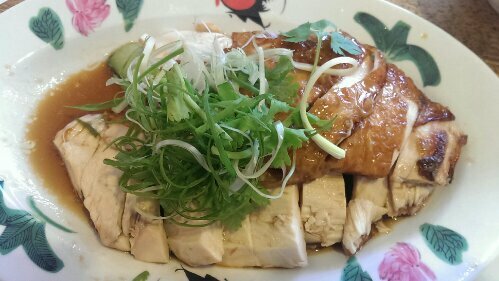 When the main arrived the meat was super tender and juicy and as so unusual for chicken breast actually tasted like chicken. Delicious. The kicker of this was the chopped coriander on top and the wonderful chicken stock underneath which was even richer in taste and had a light soy touch so that I munched up all the cucumber slices that soaked in it. For my rice I used a lot of their signature chili and grated ginger which made it all a flavor party and with every spoon I played around and changed the ratio of the ingredients. I still love this place, familiar faces, great down to earth food and even that it lost a bit of it’s coffee shop charm, the longneck bottles of beer and the outdoor seating, it still managed to retain some of the old atmosphere and definitely it’s popularity. This is one of my favorites and not only because I can walk here. I have been here a million times before and there’s a high chance I’ll be back already next week.